I was so excited when November rolled around. Soup season was finally here. The days turned cool, the nights turned even cooler. And then those hot desert winds started to blow and it was 95 degrees again yesterday. But seeing as my oven is currently waiting to be fixed, I had to come up with a healthy stove-top dinner for the family. Even though we generally lean towards eating more plant-based meals, occasionally we do eat meat. 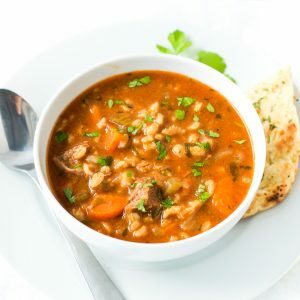 So I decided to put together this hearty beef and barley soup. 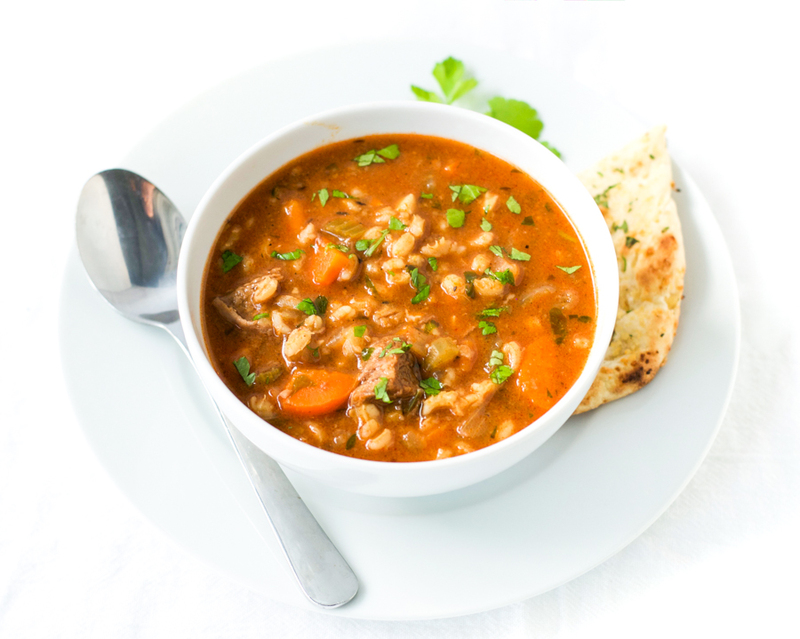 The method for making this soup is very similar to making a beef stew. The main difference is that there is more liquid, making it a soup instead. You brown the beef. You sauté the vegetables. Then you mix the beef, broth, and seasoning, and simmer it slowly until the beef is wonderfully tender. 45 minutes before it is ready, you add the sautéed vegetables and the barley, and simmer until the barley is cooked. 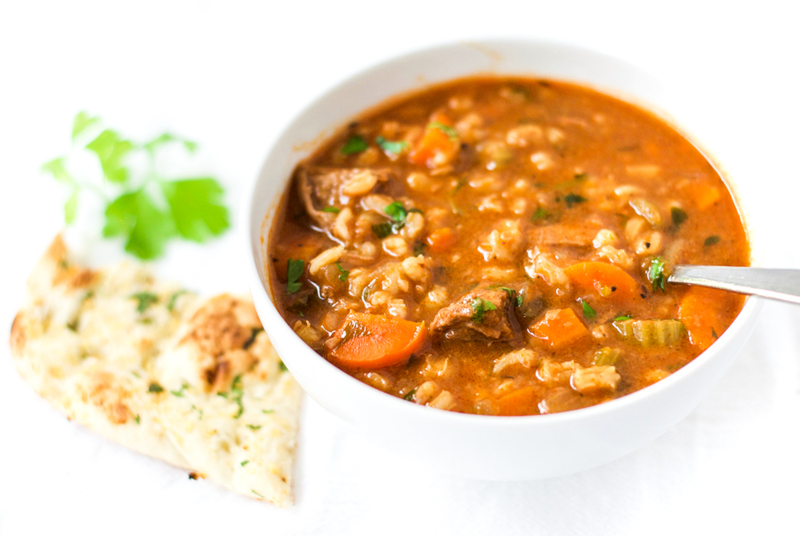 The result is a rich-flavored broth with tender beef, healthy vegetables, and hearty barley – a winning combination. 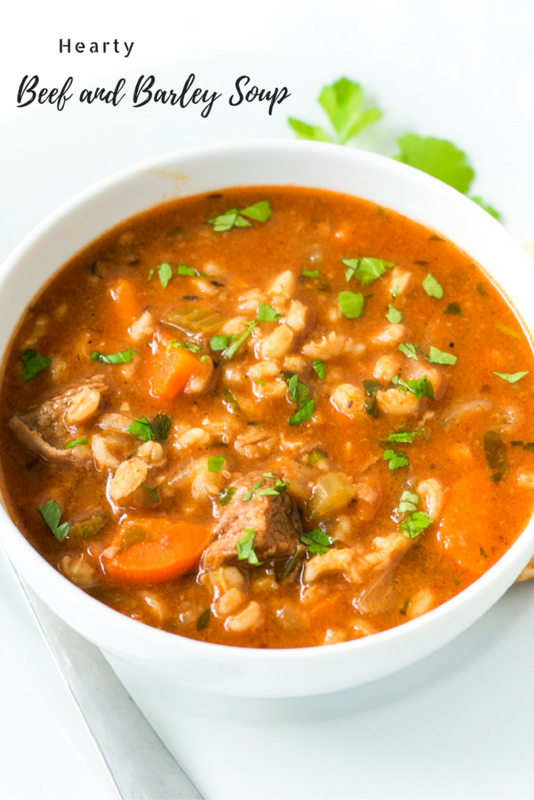 You can serve this beef and barley soup with crusty bread, or just on its own. Either way it makes a nutritious and satisfying meal, even on a 95 degree day. In a large bowl, stir together salt, pepper, mustard powder (if using) and flour. Add the beef cubes and mix until all the meat is coated with the flour. In a Dutch oven or large pot, heat 2 tbsp of the oil over a medium-high heat. Add the beef and cook until browned on all sides (about 6 minutes). Remove the beef and leave to cool. Once cool, cut into smaller cubes and set aside. Meanwhile, heat the last tbsp of oil in the Dutch oven over a medium heat, add the onions, celery, and carrots, and cook gently for 5 minutes. Put the tomato paste into the pot over a low heat and cook for 2 minutes, stirring well. Add the beef, balsamic vinegar, broth, bay leaves, and thyme and stir well. Bring the mixture to the boil, then reduce the heat to low, cover, and simmer for 1½ hours. 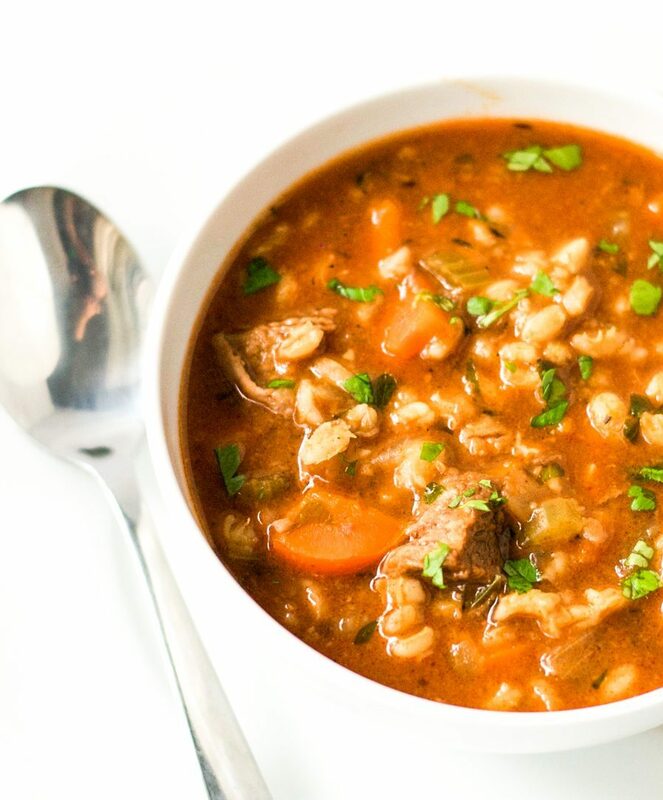 After 1½ hours, add the barley, sautéed vegetables, and water, and cook for a further 45 minutes. Remove from the heat and take out the bay leaves and thyme (if you used fresh). Stir in the parsley and serve with a side of crusty bread. Thank you for your kind comment Ruby! 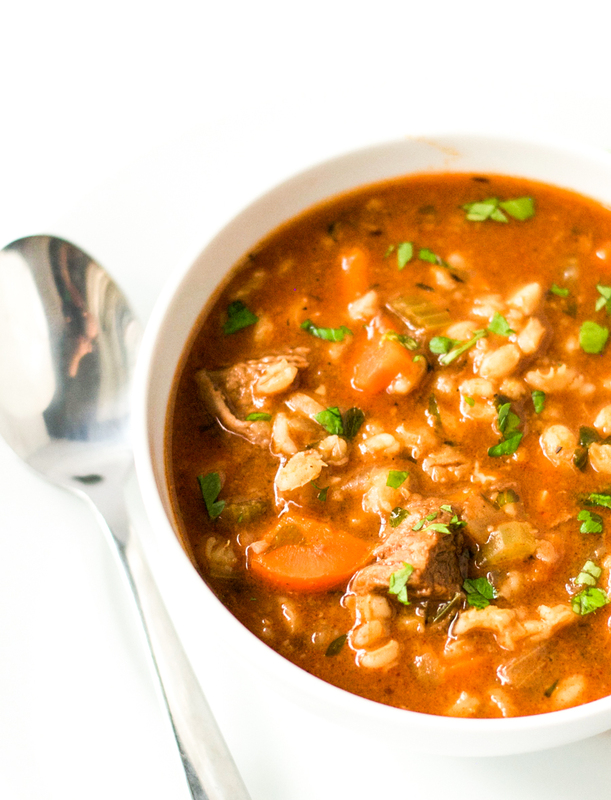 Cooking with barley is like cooking with rice. Just throw it in, simmer for 45 minutes, and you’re done. I hope you like it. This makes a wonderful eat on a cold November Sunday morning. So hearty and healthy! Thank you! Yes, it is perfect for November. Oh, this soup looks and sounds heavenly! 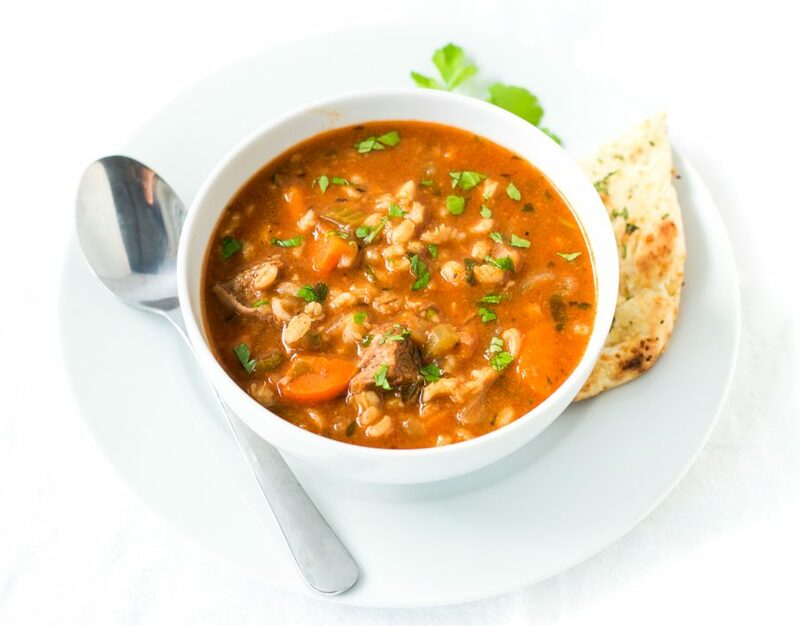 Just perfect for cold weather 🙂 Thanks so much for sharing on the Healthy Living Link Party! We hope to see you back tonight. Pinned!